Atlanta (CNN) - Congratulations to Spain for deservedly claiming their first World Cup, but man, what a terrible final. It was never going to be a classic, mind you, with the Netherlands compelled to break down Spain’s midfield artistry by hook or by crook - or risk being passed to death. However, the cynicism of the Orange went way beyond what many believed they were capable of, even provoking the Spaniards into some football that was very unlike their usual renowned "tiki-taka" style. In the end though, the best team won. Well, to my mind, the best team on the day but the second-best team in the tournament. I thought that, apart from the semifinal, Germany played more incisive football than the Spaniards, whose short passing often failed to produce the clinical finish their elaborate interchanges deserved once David Villa went off the boil following the quarterfinals. And, let’s be honest, eight goals in seven games by La Roja tells its own story. But a win is a win, whether you do it by one goal or a hatful. So, apart from the fact that Spain rules, what else did I learn from this World Cup? Well, I think that the continued homogenization of football - with players moving freely between clubs of different countries, and those clubs being so familiar with each other through Champions League encounters - makes for too little contrast in styles to produce great matches. There seem to be only two ways of playing nowadays: defend in numbers and catch teams on the break, or frustrate your opponent by playing endless keep-ball and eventually nicking a goal by attrition as Spain did time and again. Both methods can produce the desired result, but don’t necessarily get you off your seat too often. The second thing I learned is that football has got to come into the 21st century by any means necessary. Goal-line technology, video replays, five match officials or more (with the pace of the modern game why not have a referee in each half as well as someone on either goal-line) - whatever it takes to get the decision right. Some may reject the idea, but if you do so on the grounds of expense, check out world governing body FIFA’s 2009 annual report and you’ll find it announced profits of $196 million and boasted reserves in excess of $1 billion, which is more than enough for a few-dozen cameras and some replay machines. If you feel the use of technology would be undemocratic because it couldn’t be universal, well no-one is saying we should have five officials and a battery of technical equipment for games between Tiny Town Rovers and Mickey Mouse United - only at the highest level where so much money and prestige is at stake. And if you don’t want the additional safeguards because it takes away the human element - well it does, it takes away human error, and there is no definition I can find in which error is a good thing. The third thing I’ve learned is that the rules of football need to evolve. With the proliferation of cautionable offences I’d like to see the introduction of another card, perhaps a blue one, because at present players get the same yellow card for some minor transgression like kicking the ball away in petulance as they do for a scything tackle. Two blues could equal a yellow, two yellows make a red. That way the punishments could fit the crime, and you wouldn’t see players or referees hamstrung for the bulk of a game because of a card awarded for a small infringement in the first few minutes. I’d also like to see penalty goals awarded for a handball on the line that stops a certain goal. Asamoah Gyan should never have been put in the position of having to take a penalty during extra-time of Ghana’s quarterfinal with Uruguay, because he’d already have scored but for Luis Suarez’s "professional" handball. Rugby has a penalty try, so why not a penalty goal? And, on the issue of halting play for supposedly injured players, why not have a mandatory two minutes off the field for anyone who requires the game to be stopped for treatment? If you’re really hurt, you need at least that amount of time to recover. If you’re faking, you punish your own team. That would stop simulation in a hurry, wouldn’t it? Finally, I’ve learned that the idea of football being a great leveler is not empty rhetoric. For me, the highest compliment I can pay to the organizers of Africa’s first FIFA World Cup is that - aside from the drone of the vuvuzelas, which by the end of the tournament were being blown by just as many non-Africans as Africans - this tournament appeared no different to any other in terms of the ambience and efficiency. FIFA president Sepp Blatter wanted a uniquely African World Cup, but he didn’t get one. And that’s a good thing, because, as a part African myself, I suspect the uniqueness he was talking about was based on a cultural image rooted in the continent’s colonial past. Instead, we saw a modern Africa hosting a modern World Cup which in many ways was indistinguishable from any that had gone before it. And, in a rainbow nation, maybe that’s the way it should have been, because, under the skin, we’re all the same. This person seems to have a solution for all. Love this lines, "there is no definition I can find in which error is a good thing" and "because, under the skin, we’re all the same." Great synopsis !! Very well said...I hope Blatter and his team read this article. Bravo! One of the great things about soccer is that there is a ref that calls things that sometimes might not be right and sometimes misses things and doesn't call them when he/she should. But that's the point, in soccer something doesn't happen until the ref calls it – a goal isn't a goal until the ref says it's a goal, not a computer or a fancy camera system. It's all part of the anticipation in the moments after the goal to see if there are any raised flags, if the ref has anything to say or if the goal stands. I'm not sure how you can get around defending in numbers. It is acceptable in American football to try to match one for one, why not in soccer? There certainly have been cases of defenders connecting, like on the goal set up by Boateng for Germany on Saturday. I agree with everything except the handball goal idea. That's ridiculous, in football it's not a goal until the ball crosses the line, if a player can save the goal with his hand, it's completely fair, the other team is awarded a penalty kick and the player who commited the infraction is sent off. If Asamoah Gyan didn't score the penalty it's his own fault, nobody elses. Suarez did the right thing and he was punished for it, he was sent off, was not able to participate in the penalty shootout and was not allowed to play in the following game. What else do you want? Ghana did not deserve to pass to the next round, it's as simple as that. They should have a coin toss before each game. The winner of the coin toss wins the game. It would save everyone 90 minutes of their life. This is a global sport...not Basketball, American Football, Ice hockey...all great sports...the "goal" is to copy football...Lebron James may be a superstar...but is his sport watched with such passion.....Goooooaaaalll! I thought this World Cup was very exciting and that FIFA's theme of racial harmony was commendable. Till the very end that is. Am I the only one that noticed that the children that flanked Spain and Holland in the final game were mostly white? There were only three black African children amidst the 22 on the field as opposed to the earlier games when they were a majority. Am I'm being too picky? I don't know, I just saying. By the way I just finished reading Nelson Mandela's autobiography. All I can say is. The world owes you Mandibi. To me Thomas Mueller did an unecessary foul, for nothing, to get a 2nd yellow and missed the match against Spain, by that destroying the Teamgeist of the Mannschaft and the best team in the cup to win. Blame on him and all those idiots who think a short "gain" by foul is worth it. Lesson learned #2. Stop Terry Badpoo writing about something he does not know about. I agree 100%. It is one thing to have an official make a wrong call on a trivial match, but to ruin 4 years of work and investment of a team and the hopes of an entire nation is quite another. In my opinion it far outweighs FIFA´s arguments. It is also a very wide door for curruption to get in, a game today even a world cup final can be decided in an arbitrary call by a currupt official and no one could even notice it. It is time to make the changes that this beautiful game demands. Well, you have some interesting ideas, like the blue card and the two minutes treatments, but, commo'n, don't insist on the Suarez affair! that rule you propose is, with all respect, nonsensical. A goal is a goal when tresspasing the line, that's it. Suarez is an will remains a heroe for his country and for football lovers. Football is by far the most popular sport in our planet (and maybe beyond) due it's simplicity. Let's keep it like that. I totaly agree with this article!!! Spain won but the football lost. I mean if they would score mass goals by all their chances. I wouldnt say anything. But they need arround perceived 50 chances every game to have 1 simple goal.. I agree with most of your comments but would like to offer you some recommendations of my own: 1)On the use of blue cards; it would bring too much confusion and complications to the referee. For example what happens if you get a blue and a yellow card during a game? What would that mean? My recommendations is to leave the yellow cards rules just as they are but with one exception: 3 accumulated cards (not 2) in different games equal one suspended match. 2) On the use of technology: use replays only for doubtful red cards, penalty kicks or uncertain goals. You can also use goal-line technology for the latter. Contrary to what FIFA or Blatter say, neither of these technologies will delay the game any more than the players or the referee already do with theatrical displays, mistakes or complaints. 3) On the offside rule: this ridiculous rule only manages to stop the flow of the game and to break some beautiful and exciting plays so, why not limit it? My suggestion is to make the offside rule valid only when the player in question is inside the penalty area.I think this change would allow for more offensive and exciting games as well as more goals. That's all for today. Keep up the good work!! You can't have a blue. Next people will ask for a green card (no pun intended) and we will be approaching the whole rainbow spectrum. On the other hand, we should have 2 reviews for each team per half, and if the call on the field is overturned, the team should be allowed to keep the review (like NFL). Also, if a referee makes more than 2 calls that's overturned in the game, he should be given a red card. How can the Dutch players dare to complain about the referee (Mr. Webb) after their exhibition of karate and intimidating tactics against the Spaniards in a dismal and insulting display of "bad" soccer? They could have easily been left with nine players in less than 30 minutes of play if Mr. Webb would have been more stringent with the rules. Moreover, how cynical can they be? Have their players and coaches already forgotten they reached the Finals after they defeated Uruguay only after the referee validated their second goal that took place on a clear offside position ! Turning it into an American sport? Eh.. no. Mr Baddoo definitely has no clue what football is; it is like reading an Italian sports commentator talking and making suggestions about the US baseball world series. By the way, how many countries play on that "world series"? As a team , Spaniards are the best . Their well-organization and skills are second to none. I beg to disagree with Mr. Baddoo regarding Luis Suarez. Everyone knows that to score a goal in soccer (football, futbol), the ball should pass totally over the goal line between the goal post and under the crossbar and no rules may be violated (such as has been the case of the infamous handballs of Maradona or Henry). Luis Suarez did not violate any of the FIFA soccer rules. Is up to Mr, Baddoo to write a cogent proposal to modify these rules. Perhaps, he should expand his dissatisfaction and attempt rule changes for rugby, field hockey, Australian rules football, lacrosse, cricket, or any other sports..
A lot better than anything I've read in the Euro press. Netherlands played really dirty. I don't understand how they can complain about the referee. They deserved 2 or 3 more red cars. Spain was the just winner of the worldcup. Most of your points seem to come from a typical USaian view. You guys don't understand football, please go back to your baseball, walmart, and hotdogs. I think this match was superb! It was a duel of titans. A great demonstration of soccer. I don´t like your comments. Seems that you better stick to baseball or swimming. I think soccer has to stay the same. As it is we enjoy it... a blue card would enlarge the game and never be fine anyway. Things happen and in soccer the one who wins is the one that scores not the one that had the ball for longer time. I enjoy the idea of mandatory time off the field due to an injury, and maybe even goal line video. However, another card introduced into the game would just make things more complex. In addition, penalty goals would just result in debatable calls on whether a hand ball was "penalty goal worthy" or just an accident. I was in shock that the Dutch guy was not sent of the pitch. Hope they will ban him from playing official football now for at least five years and that he will have to pay loads and loads for having ruined the Spanis footballer´s future football life. If it had been a skier in a world cup who had been caught taking drugs or whoever – it would have been a big deal – but it seems that footballers are more or less straight out of prison – and allowed to just be bad men on the field – getting their frustration out. I believe one should continue calling the game football – but get more strict rules and also have TV judging while the game is on! As a television spectator it was the most boring game of the World Cup series. Talking about wishes I believe, getting rid of the offside could help get more scores. People say that someone will just stay all the time beside the goalkeeper, and maybe so, but some defender should stay and cover. Just like other sports. And some system like in the NFL to let coaches challenge a decision. Like you say the goal is to remove human referee error. To remove things like the famous Hand of God of Maradona. For argentineans it is a great thing, look at this smart guy, but it is really a disgrace. Human factor (if you want to call that a referee not seeing or not wanting to see a play, or cheating or fooling the referee) will allways be there like in any other sport. But things could be more fair. Fifa should aim for Fair Play so it is not just a phrase. Unfortunaly Soccer is a business and some people like controlling results or biassing on behalf of some teams. What happened to the US, Mexico, England and others, should never happen again. I dream that someday the Philippines will send a respectable soccer football team to the World Cup Soccer Tourney. Basketball has become the national pasttime and is beginning to be boring if not nauseating. De Jong goes, "THIS.....IS......WORLD CUUUUUUPPP!!!" If FIFA does want to really showcase its game, then I think they need to seriously look to incorperating some of your suggestions. Without doing so, leaves me with a lingering thought that some of the referee's were just trying to keep an average team on a hot streak, from beating an established fan favorite, so the profits and the good ole boys club win. At this level, you want the call to be correct, especially on a goal or offsides. Maybe if the bad calls were against Germany or Brazil, then change would occur. Not impressed, football journalist are like the weather man they talk after the facts, Holland could have won then they would have said they were the greatest. football can improve when new technology will be used to assist the referee, due to referee mistakes players might be frustrated and loose control, indeed the Dutch played rough football but as bad and may be worse when the opponent for any little tackle will be screamiing to attract referee attention, bottom lines nowadays players are more talented actors than talented sportmen. Agree would 100% with one addition. Actual injured play are forced to stay out of game for 10's of seconds the team is deprived of one player, but the opp-player who actually commits the foul and (with a yellow) is continue playing. many of the time i find it unfair. The player who commited the foul should be out of play at least as long as the injured player is out of play. As a South African living in Cape Town and being part of the whole 2010 World Cup experience... I can honestly say that I agree with the sentiments that goal-line technology needs to be implemented. In the same vein, being the sport-loving South African that I am... I'm also a HUGE rugby supporter (Springboks and the Super 14 franchise team The Stormers/Western Province)... FIFA should learn a thing or two from the IRB. Soccer needs a citing commission and players need to be cited for poor behaviour or too much acting. Banning them for a few weeks will quickly teach them to stop playing for Oscar's in each game and very quickly the game will start flowing with less theatrics and more football (like it's meant to be). Sadly most games are played these days with the idea of milking the ref for yellow and red cards and using fouling as an actual game tactic to swing the game... for this reason citing would be a great way to punish players who try to influence the outcome of the game through nefarious means like faking injuries. It annoys me to think that FIFA's "Fair Play" banner, anthem and all it stands for somehow seems nothing more than a joke to the players and the respect of the spirit of the game is shocking. They wilfully foul and fall over like fairies just to benefit their team... this is no tactic and certainly not in the spirit of the "beautiful game". The reality is that the team need to play a game and play to win based on their skill, talent and ability to work together as a team and to play the game properly. The final was a terrible (and boring) example of how a game of soccer should be played. Germany vs. Argentina, hell... Germany vs. Uruguay... good games! There were others to mention (Portugal vs. North Korea). The final... well... lets just say that I was dying for someone to score a goal in the 2nd half to end the pain and prevent me having to endure extra time (which I did anyway). Great commentary. Here are a few things I’d add. Adding another card (a ‘blue’ one in this case) would be interesting, but might prove problematic. After all, there are times when a player is shown a yellow card and many would argue it should have been a red, and vice-versa. Adding a third card might make this situation even hairier. Instead, I’d propose doing away with ‘a-yellow-card-in-two-consecutive-games=one-red-card”. I think one yellow per game is fine, without exception. If it’s that harsh a tackle, then the ref can simply use the red card. Second: No penalty kicks in the semi-final games/final game. Too much on the line. This championship is once every four years. Don’t shortchange the fans. Make the players earn a real goal. If they know penalty kicks don’t exist, they won’t dog it at the end of the game. Third: Why only 3 substitutions? Stupid. How many sports have this rule? You have a roster of 23 players – there’s no reason why they shouldn’t all be able to play. I agree, once they’re subbed out, they’re out – but if you want to make the game more exciting, allow more substitutions. More fresh legs on the field means more scoring opportunities, and conversely more strategic moves by coaches. Fourth: Replays – just an additional idea. Give each coach an opportunity to ‘challenge’ a call, once per half. It won’t slow the game down more than a few minutes – well worth it if it avoids egregious refereeing errors like the ‘non-goal’ in the Germany/England game. The ‘challenge’ can be limited to certain criteria, such as red card calls, hand balls, tackles in the box, etc. To have ANY chance at the U.S. TV market, there has to be more scoring. It took ONE HUNDRED AND SIXTEEN minutes for a goal to be scored in the finals! ZZZZZZZZZZZZZZZ Widening the goals by about two feet on each side and raising the top bar about a foot might do it. Then a 3-2 game might be normal instead of a wild scoring affair. Also, there likely would need to be breaks in play that would permit commercials for soccer ever to succeed on U.S. TV. Right now, the game is just unwatchable unless you have a major rooting interest in the outcome. Look for zero ratings for soccer until four years from now - and if the U.S. should fail to qualify, look for a big drop in ratings. Blue cards? Penalty goals...? It'll never happen. I fully agree with everything you said. I'd say that video technology and more referees will also decrease faking injuries and unnecessary flopping, because now everyone can see what exactly happened, from multiple angles! I also think there should be some kind of consequence for unnecessary flopping, so we can go back to playing soccer rather than acting. I could not agree more with the 'other' Terry! Your observations about the games themselves are right on. I missed 'the beautiful' game throughout the matches. Yes, there were some glimpses as in the Uruguay-Netherlands..the goals by van Bronckhorst and Forlan (by the way I totally agree with the latter's recognition as Player of the Tournament for both his behavior on and off the field!). But the Final was dreadful! And yes, technology has to be used..Lampard's denied goal is still on everyone's mind..As to new rules: a goal as blatantly stopped as Suarez did..should be awarded automatically...like is done in basketball (goal tending!). Lastly, we do need to stop the over the top 'diving/acting' that takes place ...wasting time and in a number of cases drawing 'yellow' cards that were not merited. In spite of all these shortcomings (that can easily be corrected), I enjoyed the 2010 World Cup immensely..and find myself already missing the excitiement and anticipation before every match! Thank you for your coverage, observations, and analysis! Great article. It is time for FIFA to understand that the "old" soccer rules need to be changed. Let's hope by 2014 will see some changes in the most watched sport event in the world. You say Germany is #1 when Spain beat them and then won the finals? Delete this, WTF bomb. Some more thoughts on rule changes: Off-side calls are missed very often, and we miss exciting plays and shots on goal, and games are decided on these calls. 2 suggestions: let the play continue, like when a referee delays a call when an offense has an advantage. Have the off-side reviewed upstairs while play continues. If it is confirmed and the defense has captured the ball, play continues unchecked. If a goal is scored, it either counts, or the defensive goalie is given a free kick. Another alternative would be something like hockey, whereby there would be no further off-side rule once the ball was put into an offensive zone. Offsides is simply too prone to mistakes, and most fans hate to see games where the officials are more important than the players. I absolutely agree with your recommendations. The end of the Ghana game was a true crime and Luis Suarez’s "volleyball" move was entirely dishonest and deliberate. Even more insulting is having he quoted as boasting on being the back goalie! In some many other professional sports technology and common sense rule the day on what humans can & cannot do with respect to making proper calls. Professional football is crying out for an upgrade! Glad to see that you are pushing for these changes when the entire world sees the shortcomings of what FIFA is doing. Maybe there also needs to be a change in management at FIFA as well! Financial success should not be the sole benchmark for a successful management of a "business". I heard FIFA president Sepp Blatter quoted by an ESPN analyst as saying he didn't want technology used to reduce officiating errors because the errors increase public discussion of the game. If he said and believes that, what an incredibly cynical attitude, though consistent with the generally massive influence of finances on professional sports. we are from all over the world are glad that the idiiot netherland doesn't won world cup. 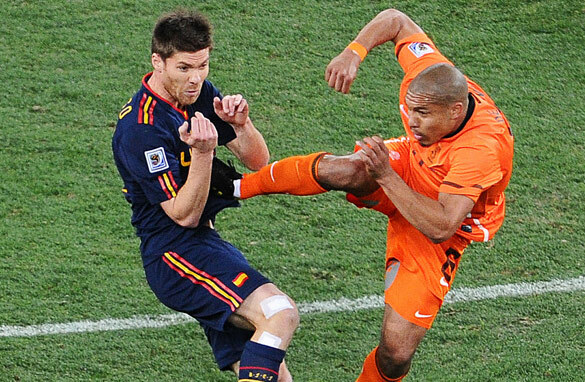 Fair play is the main key for the real football player .Nigel de Jong who played soccer as kick boxing ,,,,fifa should think about him and suspend him for few years from playing soccer ,,,,so that will be the fair judgment for Xabi and all of the soccer fans !!! I think it is time to use the technology, but first of all the president of fifa should be chanched by youth with all respect to him. Thank you for this article Terry. I cannot recall another world sport wich cought so many attention in questioning its regulations as it actualy was ongoing in front of millions of ppl around this globe. The FIFA will have to create an answer to the unfairness. The full HD replay images of fouls & movements, as we can see now from almost every perspective, are creating the most of the "emotion-avalange" as we now can clearly see what realy happens in all of those split seconds. It is also the FIFA who rules the rights to all of these pictures, they positioned the cameras, the ppl, and the technology, the flow of replays etc etc...selling them for hard money only like seats in an ancient gladiators arena. The FIFA creates its own unfairness by selling emotions, the good ones..and the bad ones, and wants us to believe that it is all about the football. I hope they realy play back they're own movies and create a better base for future football. soccor should not be stopped mid play for even a second. I cant watch basketball or football because all of the breaks in plays means commercials. I love soccor because there are no commercials. i have one question for FIFA,what are they doing about players who get their friends sent off by play acting.i strongly feel they should be punished off the field if not on. Terry you have a lot to learn about Football before you can go making those recommendations. I'm an American citizen living in Spain the last 4 years, and being here has given me the opportunity to finally understand this sport. Anyone from outside the states reading this article would laugh out loud at most of your recs. However, using technology to eliminate bad calls is the only one that makes sense and is doable. Hello my name is Prince Emmanuel, Living in Accra Ghana, i love David Villa, he is a nice man he really try for all with other Spain player they all try any way i will take the next world cup to African it is my own time i believe that the world will know me soon God Bless the world more and more also with CNN Officials, Thanks. Sad to say, but the dutch were robbed... I feel dirty just saying it after the way they played.. Puyol should have been off the pitch and the goal should have been a corner to Holland. That said the dutch should have been down to 8 men and the "better" team won (although it has to be said the spanish were less than clean as well). Not sure the one red card was a red card either.. although that might just be because of how bad other tackles were compared to it. in my eyez, Spain was hot fav. they played really classic game. they didnot play football like Holland did to kick directly on bodies of players. Spain played very sensiable game. 1 rule i want FIFA has to change which is, like in Ghana game that was a goal when a player stoped the ball with his hands. i want if some1 do this thing Refree has to give a goal caz if he will gives Red Card or palenty its 50/50 may be player miss that plenty but that was a goal & caz of that goal Ghana who was playing really good game they were out from cup yaah they are weak in palenties its truth but Ghana has a good team as well. But I've learned that media love to hype something! First, about the England, Argentina and etc and now kung-fu kick of De Jong,"a murder convict"! You should be ashamed! As a journalist and a writer nothing should be biased! I wished european leaders had the same spirit for evolution. Unfortunatly, in europe many people are afraid of changing their habits, and for leaders, their power and control. There are so many things that can be done in football, but for that we would need some young people to get the captainship, not only a bunsh of pre pensioned people. I also want to add that Suarez did what he had to do, just like Thierry Henry did with Ireland. Except that for Titi, a replay would have cancelled the goal and would have been given the proper sanction. Today, 2 million people have hailed the world champions by arriving Madrid. The TV show has been the most viewd of all times, worldwide. Changes?. Football (soccer) is not an entertainment. It is a passion. I agree with most of the article with the exception of the penalty goal. The Suarez save was and should remain the drama of soccer. I think it's more important to eliminate referee error because this is the kind of drama we don't need. We most defintely should not have referees that start to create sort of their own rules because of the way some team is playing. Which seemed to happen in the last part of the final: While the Dutch committed (too) strong fouls in the first half, Puyol was wrongfully not awarded his second yellow card after he pulled Robben down after he broke through, which would have almost certainly been a goal, and an awarded Spanish goal after non-registered off-side and obstruction against Eliah, and a clear unmissable corner not given in the last few minutes, all point to a referee that after a while started leaning a certain way. Which, in the end, even though the Spanish were better for most of the game, did cost the Dutch the win. It's a shame the de Jong "karate kick" turn the discussion into "how dare the Dutch..." when it should be "how could the referee...". Football dynamics turned into baseball with a three hour game. Will people sing "Take me out to the ball game" during a so far non-existing commercial break? Football enthusiasm turned into American Football. Will players stop with their magic passes just like the American Football players stopped tackling? Soccer is much more like Hockey. There's no room for excessive penalties, it would kill rivalry. Imagine Brazil vs Argentina or England vs Argenina, or France vs Italy without a fault? Hockey is much less violent nowadays, but who would watch a hockey game "in the name of love and politeness"? Not the people I know. So the guy bumps into another player ... brown card ... blue card ... green card ... yellow card ... purple card ... red card ... see how bureoucratic the game can get? My advice is keep on practicing and trying alternatives, but killing the spirit of Football by trying to buy time for a commercial break or by mechanising the game, will turn football into another sport and not the world's most watched event. Replays, excessive penalties and refferee will kill the players desire for perfection, after all, someoe will alawys be watching and replaying. A mistake will not be overcome with struggle and team work, but through the laziness of technology. Would that be the birth of couch-potato Footbal? Terry! good postmortem exercise. kudoooooooos! Who would like this to happen to them! This is a great article. Congrats and thank you Mr Baddoo. The FIFA World Cup can be compared to the Summer Olympics. World nations compete against each other. The difference is that in the latter technology is used and the former the senses of a couple of human beings. Destiny plays a major role in winning the FIFA Cup. I was also impressed at how the Spaniards could run and run and never tire – not just one, but all of them. The Dutch, however, were visibly exhausted towards the end of the game. Does FIFA test for doping? That should also be in FIFA's "to do" list. FIFA is like an elefant in a porcellan store. It requires a major overhaul, otherwise the world games' theme becomes: survival of the luckiest! The final game was disaster because it was all european, disgrace of a game. The South Americans bring magic to the world cups and that has now been proven. Brazil in 2014 will be the best of all World Cups. This was the worst World Cup ever. Just like every sport in the US we indeed need Goal line technology and video replays. Even the goal scored by Inniesta in the final was a mistake made by the officials. As a Dutch I want to agree. I think what De Jong did was very bad and he should have been sent of the field with a red card. He really made us look stupid. The whole game is overshadowed by this incident. Of course the Netherlands played agressive, they were tired and wanted to win. So did the Spaniards though. The ref was very biased towards the Spaniards and you can see that if you look back at the game. He should given this corner and should have been more consistent. And if people complain about De Jong, they should also complain about all the players kicking on Robben all the time because they knew he was one of our best and was injured.... But again, the best won, Spain. But the Netherlands did extremely well to end up in final. Soccer commentary on (American) CNN 🙂 I like that! Cool!! I think there's an easier solution for all these problems. Before each match, let's ask Paul the Octopus "Who is going to win?". Then let's announce the official winner based on Paul's opinion. By doing this, FIFA can save their what ever the billions of reserves, and increase their profit by five fold for next few years. Blue cards, fifth officials, cameras.. all these out of equation! We have a one silver bullet solution "Paul the Oracle Octopus"!!! I sincerely hope this comment will pass through CNN comment policy and moderation. This is not a hate speech against "Palpo Paul"
It seems to be just De Jong's foul (mind you: an equally shocking foul was comitted against a Dutch player in the semi-finals (a full kick in tha face) and hardly any journalist mentioned that one the day after) that gives any so-called football "analyst" a reason to be completely disrespectful to a team that reached the finals. Besides: Heitinga should not have been sent off, van brockhorst got a yellow card coz some spaniard was diving, both iniesta and puyol could have been sent off the pitch just as easily (the same counts for Robben en Van Bommel though). Just because Spain has the best midfield in the world, doesnt mean you should overrate their whole team. Germany played the most attractive football. Would have loved to see them win the semi's. Everybody’s talking about the Dutch playing rough and dirty!? I agree that some nasty fouls were commited (on both sides!) but may I remind you all that only the Dutch reached the worldcup and finals unbeaten(Didn’t they beat the tournaments favorite??) ! For me one of the most important aditions to the rules of soccer should be a big red card for every player who fakes a faul play. In that case I think Spain wouldn’t have reached the finals in the first place 😉 . In some cases like the de Jong kick, one almost wished that the ref had a stun-gun instead of a yellow card on him. Don't get me wrong, it was a great kick – my own trainer would have been proud. But he teaches Krav Maga, not football. You have to do better than this post; this is your job. Blue cards? At one time, Red cards didn't exist. One of the greatest aspects of football is the referee's discretion. In some games, players get away with hard tackles, and in others, they do not. I know you probably won't read this message b/c you're a smug journalist, but do us all a favor and stop writing about football. Some of us actually enjoy it. COME ON , DID YOU SEE THE SEMIFINAL?????? YOU HAVE TO LOOK BACK THE FOOTBALL OF SPAIN IN THE LAST YEARS. TRY TO WIN AND SCORE PLAYING AGAINST "CATTENACIO" TEAMS (EXCEPT FOR GERMANY) AND............KARATE CHAMPIONS (HOLLAND). Idiotic coments by backgammon players abound. Being FIFA what it is, an international cartel of rather unsavoury characters, them being able to decide who referees, and many referees being open to be told whom to favour, so as to "include teams from the new continent" etc., the line penalty x goal exchange would be more simply resolved by using a sort of handicap system modified from horse racing. Germany starts 2 goals up, England 3, etc., thus avoiding irresponsible little teams such as Serbia or Algeria giving you a fright. Big White Man wins, little fish struggle. 1. That karate kick was un-intended. He tried to put his foot high up where he thought the ball was going to be. His dumbness was that he didn't see the other player coming. This one, the ref got it right. 2. The ref tried his best, but couldn't distinguish between the real intentional tackles and unintended contacts or even non-contacts that were given cards. And in the case of Puyol, clear intentional contacts that were not given a card. Only if field soccer is played as indoor soccer – with no physical contact – the ref would be able to see things clear and keep it clean. That would alter the DNA of the game, so better live with bad calls – and with physical tactics. 3. Soccer is a "primitive" sport compared to American sports. There is still plenty of room for development. There has been plenty of development – total football, Maurinio-football to name a few – and there are significant differences between teams and countries. I believe it were the Korean players who ran more miles per game then any other team – that's a unique tactic. The remark about homogenization of football, is like saying: there are only two ways of playing table tennis, where you usually see one more defensive and one more offensive player. Here is different suggestion: They should get rid of the offside rule. It will allow more scoring and make the games more interesting. I know that the strikers will just stand in front of the goal and wait for the ball, but the rule applies equally to both sides. It's boring to watch for 90 + 30 minutes to see a 1-0 score. The offside rule is too prone to referee error anyway. In 2014: Brazil's World Cup!! Nice picture, but why don't you show the ball? The ball was really there so De Jong played a dangerous game but not at all deserving a red card. And how can Iniesta stay on the field with 2 yellow cards? From the moment you called the sport "football", I knew this was going to be a good article. What seriously did put me off while watching the game though was the fact that Spain was just diving, and diving, and diving. I really hate to see football played like that. La patada del holandes ha sido muy comentada en España por ser anti deportiva total porque para eso hay otro deporte mas adecuado, y el arbitro le saca a otro la tarjeta por protestar cuando llevaban todo el partido asi falta asesina y protestar....la actuacion del arbitro no fue adecuada deberia sacar tarjeta por lo menos desde la segunda protesta por parte de Holanda se veria un partido mas deportivo. Su majestad la Reina de España se intereso por la salud de Xavi Alonso... la foto lo dije todo. Donde quedo el juego limpio en el futbol? Felicidades a España a Africa por la organizacion y a Potchefstroom donde tambien trataron a los españoles que se fueron triste de alli y a todos los hispanos del Mundo cuatro años campeones.. Desde Canarias. How about giving each team three opportunities to challenge the refs decisions (like American football). If a team thinks that the ref has made a wrong decision they can challenge the decision to be reviewed by the fourth official. Each team gets three chances to challenge in each game. If you win a challenge, the refs ruling is overturned and if you loose the challenge, the opposite team gets a free kick! The problem with a goal line technology and a slew of video cameras is that the ref will have to stop the game every 10 seconds to review decisions. As you can not go back and review a decision from 2 minutes earlier. Blue cards? c'mon! no way! I agree with replays and all. But penalty goal? No, gyan could score, suarez stopped, and he was punished for that! what if it happened at 30 minutes of the first half? no one would say a word about it. Now, gyan had the opportunity to score on penalty (which in my point of view, is really hard for the goalie to catch it) but he missed! Suarez was punished for that, that was correct, he couldn't play for semifinals, which, maybe could help uruguay go through finals... who knows? Now, Spain is the champion and in my opinion they were really awful, such a terrible game! but, they scored. Some good piece of journalism and whole world cup situation analysis. The final was a shame for the football in general en for the Dutch in particular. For the people who criticised this article on the grounds that Terry Baddoo knows nothing about football and should stick to covering American sports – Google his name before you speak. He's a former semi-professional footballer, a qualified referee, and ENGLISH! Plus, he's covered the game at club, European, and World Cup level since the year dot. If you don't like the piece, no problem, but come up with a more well rounded argument than merely - Who is he to be saying these things? It just makes you look stupid. The Dutch were playing rough and more of that stuff, but I can see that many of the reporters themselves either don´t know the sport or haven´t seen the game. This player above was trying to kick the ball (in a risky procedure) when he kicked the Spaniard instead, as the ball was kicked away exactly before this. And for those who did watch the match and aren´t just commenting on the headlines Spain did her share of fouls as well. The only difference was that some of those, like the one against Robben, that prevented him from scoring went unseen. The Fifa should add something to check on the refs. In sunday´s game there was the corner that wasn´t awarded to the Dutch after Sneijder´s free kick that hit a Spaniard and went out. And of course the English goal against Germany that wasn´t counted. And by the way, why do you call football soccer? There´s a reason that American football carries the adjective American. No one team not even Germany play the game to win, all teams that played against Spain, play "not to loose". As you may know, it is very hard to score a goal when you have the entire team in your own net. this world cup made me see that footballers can really act. some players over react. the world cup was great. One has to wonder what the outcomes would be if the side judges didn't make so many errors. Lines are marked on American football fields that greatly assist in recognizing offsides and there are two officials watching for offsides infractions. Soccer (world football) couldn't have created a more error prone system than the one now used for making the offsides call. And to have the rule at all is questionable. Ice hockey uses a blue line restriction. This would also work better in soccer. Well congratulations to Spain anyways, but germany was certanly the best team. This English referee sucked big time. Holland deserved a penalty when Robben was pulled down. Well put... I do agree with most of the ideas while few are for the time being regarded not-so-urgent or fall behind in priority ladder. We have to remember how difficult FIFA is toward change already. Therefore, it must be fed in bits to have a chance to succeed. For me, on-line technology – YES, although limited and to be decided by Fourth Official who will communicate via already used wireless communication devices with Referee. Penalty Goal, DEFINITELY, a fitting punishment as how can a 100% Goal cut to arguably 50% chance of one be called fitting justice even though a Red card produced. We must remember that if a player is in the Goal, as Suarez was, he is not considered to be in the penalty area, therefore the FIFA regulation with respect to a definite intervention in penalty area resulting in a penalty kick and a red card cannot stand. To me, these are the most urgent steps that must be taken to modernize the game in par with other sports. I am growing tired of commentary from people who are mostly uneducated about the sport. There is a "card" more minor than a yellow. Its called a foul. Yellows are not given out for "minor transgressions". If it seems minor at the time the yellow was given out its because the player is a repeat offender. Kicking the ball away delays the game and automatically results in a yellow. Introducing a blue card will never happen. I also disagree with allowing video technology into the sport. I would rather see 2 additional linesmen. Video technology DOES slow down the sport and its a slippery slope from reviewing goals to reviewing all fouls. Not to mention most leagues cannot afford the technology. I'm not sure why you think FIFA would be the organization spending the cash since they seem to only run international tournaments. Id like to congratulate you on this article which I liked very much, although I don't agree at all when you say, as well as some other readers, that Germany was the team that best played in the world cup or that Spains game is just "catch me if you can". Germany not only lost to Spain, but also to Serbia. Germany has a great team, and what I liked most about them is that they played clean and honest, not like the Netherlands. But even their coach admited over and over again that Spain was the best team in the World Cup and the most difficult to play and that they would win the Title. Spain had been averaging 3 goals per game before the World Cup. This is not of my invention, just look at the classification and preparation games they had been playing before the tournament. The problem was that, being the European Champions, winning to Germany in the final two years ago, everybody new their style and tried to stop them as well as they could (with some degree of success). Against Spains game, teams sat back deffensively trying to wait for an opportunity to counter attack if a chance arose. This reduced Spains chances quite a lot a made it more difficult, being every team very deffensive against them. Spains "tiky taka" is not "catch me if you can". It is a soccer phylosophy of controlling the ball with your midfield players (if they are as EXCELLENT as Spains Iniesta, Xavi, Xabi, Cesc, Silva which any team would want them on their side) and looking for weaknesses to try to open oportunities to score goals, not just throwing the ball in the area to see if somebody is fortunate enough to get the ball in a good position and score. I think maybe Spain did missed too many passes in this world cup, but it is a WORLD CUP and they are human and also a bit nervous sometimes. Nowadays teams are very strong and it is more difficult to score goals. In some cases, against weak teams it is more easy, but there are fewer weak teams nowadays in the tournament like this. Spain definitely, in my opinion and from what I've read from other professional coaches and experts, plays the most beautifull soccer nowadays whith no doubt whatsoever. They played as a team better than any other, which is the best argument one could have to be succesfull instead of loosing with only great individualities. Whatttt? I mean isnt a penalty 80% of a time a goal? Players who miss a penalty are just because they are just bad!!!! Though I understand, less soccer watching people have the difficulty to understand the beauty of this sport, but I enjoyed this article with weird ideas. Carry on man. By the way, congratulations to the Netherlands because being second in a World Cup means that you've got an excellent team that reached an excellent result. Until the final, the Orange had been my favorite. So we are second.... but we KNOW how to party too and welcome our team in Amsterdam!!! just watch the 6 o'clock news on the Dutch... no matter what... we are still behind the Dutch team!!! I've read the emails that have content. How does most everyone miss the point that Holland and Spain both had strategies for winning. The Dutch were aggressive in order to intimidate the Spanish who can pass the ball better than any team. Holland hoped the smaller Spanish would back-off from their passing attack. Spain played its usual tactic of relentless pass and attack which is very exhausting to defend. (Did Spain set the record for corner kicks in a final?) The Dutch, in typical fashion, hoped to draw the Spanish attack in, steal the ball, and score on a breakaway. They knew they had the faster legs.... if they could only steal the ball. Spain's strategy, business as usual passing, waiting for opening, and let their outstanding goal keeper handle the rest. Holland's strategy, aggressive play, steal the ball, score on counter-attack, and let their outstanding goal keeper handle the rest. As a footnote, Spain should have won 3-0 if they could just shoot straight. Thanks for that piece of observations Terry,I would recommend FIFA to adopt your wise ideas no matter what the cost may be and I bet its gonna bring more satisfaction to the players as well as the spectators. The picture above, finally, sums up the World Cup, 2010: ie rough, hard, bitter, win at all costs mentality, no respect for the game or other players. Unless FIFA steps in to stop such violence on the field, the game will lose its dignity and credibility, and eventually its audience. We do not spend time and money to watch players kick each other brutally. We see enough violence in daily life, across the world. We see sports for skills, fun and enjoyment, not brutality! Spain was by far much better than Germany.Football is not only about playing a nice game(vs Argentina),it's about keeping focused,it's about being a team,it's about playing really good(Spain did it too).Spain always tried to play,but when you are in the world cup is not that easy as you could watch in the final.If Germany is better why they didn't win Spain.They couldn't do anything.As in the Europe Final.It's not a coincidence.We have beaten them twice.Please don't try to be a modern journalist saying stupid thing.sThe spanish team was really great.it's got many of the best player in the world:Casillas,Xavi,Villa,Pique and so on!!! "FOOTBALL: MEDIOCRE FINALS, MAGICAL SHAKIRA"
Highly intelligent analysis, Terry. This must come from a long-lasting and unique interest in the game. Your article was unbiased, qualified and fair-minded. I agree with every word you said. How can any club, team, player at whatever level but perhaps particularly at World Cup level, rejoice at winning a game in which they had won by default or by outright CHEATING! We spectators have had enough of all the shinanigans – grown men throwing themselves on the ground faking a foul; lifting an elbow just that little bit too high – only accidentally of course to jab the opposing player in the face and being surprised if they are penalised; deliberately putting the boot in.. Call this SPORT! If they could only see what we see, a lot of nasty little boys in need of a good spanking! Let's have a 5 minute Sin Box to go with all you other suggestions!! P.S. The geatest games and the best players were in the past!! Dude, I never thought about it that way before. Germany was not the best team in the tournament, Spain was. Spain destroyed Germany when the two played. You don't have to win 3-0 to clearly win. Spain's possession in that game was never in question, they controlled the midfield with absolute precision. How many true German chances were there? Blue Cards? I cannot only imagine if a ref gave 15 yellow cards in the final, imagina how many blue cards/yellow cards a ref can give out throughout a whole game?? 100?? no way! Penalty Goals? why? What Suarez did is perfectly legal, and it was only fair. It was punished severely (RED CARD AND A PENALTY) What else can a team ask for??? The stupid Ghana player missed it. That's his fault, please don't have sympathy for Ghana, they blew it, not Uruguay. As for the writer, please go comment on baseball and leave football to real journalist of the sport! "I was in shock that the Dutch guy was not sent of the pitch. I believe one should continue calling the game football – but get more strict rules and also have TV judging while the game is on!" First of all, I'm Dutch. This kind of foul is described as dangerous play and I find the foul that de Jong made was way over the top, he deserved ( and got ) a yellow card for it. But in the big anticipation for the finals, I can imagine the only thing you keep in mind is the ball and they are under an extreme amount of pressure and stress. Spain's own keeper and Torres runned into each other because they were watching the ball, which proves my point. But the most shocking thing you state is" but it seems that footballers are more or less straight out of prison – and allowed to just be bad men on the field – getting their frustration out". These men are educated and I'm proud of the Dutch team. They are real sports and they let me dream of one day standing amongst them playing at the WC. I think Spain deserved to win, altough I wanted to see Germany vs The Netherlands because in my opinion Germany had the best team. Also , Webb is one hell of sob, Spain got away with a lot and so did Holland but c'mon! He needs a TomTom so he doesnt have to keep pulling cards! 9 yellow cards! Six for Holland and altough 3 of them were deserved, Webb is too present in the game, it's about the teams not the effing ref that seems to see himself as the almighty god because of his influence and sure seems to love it to display that power. I watched the arrival of the Dutch team today and some interviews given by the D-Team and you could see, hear and almost feel the dissapointment. Not for myself or for the glory that comes with winning the Cup but for those 23 men that did everything to win the WC for the last 2 years and for some even longer. That's it now, Spain won and I'm sure Holland will do it's best the next time! I'm really intrigued by the idea of the two minutes of the field rule. I genuinely think that would actually work. It would stop players from faking injuries as you say and also prevent the managers out there (let's not pretend they don't exist) who tell their players to waste time in the dying moments of a match. Very nice article. I'm getting somewhat annoyed by all comments about dirty play by the Dutch. In the current time with HD TV everything looks far worse than it really is. If you compare this with the 74 or 78 finals it's not remarkable. This is a physical sport after all. De Jong performed a stupid (but not intentioned) "karate" action and van Bommel was testing the limits (as usual), but apart from that I didn't see anything extreme from the Dutch. In the German league things are more physical and no one has a problem with it. Has football become sissified or what? And let's not forget all the attacks on Robben when the Dutch played against Brazil. The Dutch team had the most fouls but were also the team that got the most fouls against them. And what about the Spain team which excelled at asking for yellow cards (which should get that person a yellow card – those rules were in place in this tournament) and diving when nothing was happening? That should be punished as well but the Spanish team got away with it. This is football not theater! I don't agree with most of the enhancements apart from replay for off-side or questionable goals. Blue cards are rubbish, fouls are a part of the game if you like it or not. The hands ball by Suarez was what any player would've done. The Ghana player missed the penalty and that was the real problem. He has only himself to blame not Suarez. OMG, all you whining people: grow a pair already! Sure, there were plenty of Dutch fouls, but half of the Spanish squad were playing dirty as well, with the other half diving like swallows! The ref should either have been resolute and drawn reds from the start; or been fair and dish out a few more yellow cards for the Spanish. tell you what you can paint the field blue, have the referees run around the field with monocycle or a little hovercraft, the goal can be electronic to detect when the ball goes in, widening the goal 3 feet on each side and 4 feet above so we can hire a 7 feet goalkeeper o better yet leave the goal the way it is and hire a midget as a goalkeeper ohhh also you can change the name into something like.............BSfootball. Common folks the game is great the way it is. On this cup I did not see the outside shooter; I recall Holland in the past cups was deadly from outside. The only request I will make to the referees is to give yellow cards to all those players pursuing an acting career on the field and a red one if they do an Oscar presentation to eliminate the fakeness out of the game. As for the FIFA I will suggest they should review the games to ensure that referees an players are doing their job right and if not inform the world about it. I´ll bet no one will hire them. Spain lacked a high goal count in the tournament because all of their competitors feared their offensive prowess to the point that they played extreme defensively.... some to the point of thuggery (NED). This Spanish team has amazing skills. So much so that the best players in the entire world often cannot take the ball from them. Do you think that is an easy task? Their footwork and creativity under extreme pressure is nothing short of astounding. If you think they are boring to watch, then you clearly don't understand the game. If all you care about is the money shot, then perhaps you should find another form of entertainment and keep your ignorant opinions to yourself. Do you really think that the Spanish players would have played like they did if the Dutch had started playing a real fair play? Only 4 minutes had gone by and a Dutch player should have been red carded. From that point on, do you think the game would have been the same? Would there have been the same tactics in both teams? The referee let the Dutch players keep on with their dirty play from the beginning and that biased the whole game. Why were so many fouls committed in the game Germany vs. Spain? Lesson #1 Properly card teams that choose to play like the Dutch. That way they never get to the final game to make the soccer look bad. Webb did the best job of any ref for a Dutch game. I commend FIFA for having such a strong and unafraid referee for the final. What a great job Africa, and all cup teams! I've read your article with mixed feelings, meaning some points where I agree with you and some where I don't. Technology or Goalreferees would have been nice this WC. That being said, I definitely prefer additional Referees over Technology here. They should help against obvious errors, without handing key decisions of a game between humans to a computer. They're interesting for statistics afterwards, but that's about it. Also, the decision has to be made in a few seconds, video replays just take too long. Another good idea are 2 referees, because I think games are getting a bit more exhausting. A Player running 11km each game is getting pretty standard, the distance for a referee possibly even more. Yet, most referees are atleast 10 years older. Maybe switching with the 4th official after half time? Every referee does have his own style and his own way of referee'ing. Fifa trained what's what, but in the end it's his decision when a foul gets a yellow card or just a free kick. As long as this "scale" doesn't change midgame or it's way too far from median, I definitely don't mind variation. Every game is different, getting 100% "equality" between all games isn't possible anyway. Suspension bc of 2 yellow cards in different games would imo be improved, if 1 yellow only results in a 270 minutes (actual playing time) probation. Get 1 yellow and after playing 270 minutes without getting another one, the first doesn't count anymore. Free Goal no, because I do believe it was a reflex (afaik he sometimes plays keeper in training) and he could have used his head to keep the ball out. But I do think the punishment overall didn't weight as much as the gain, atleast not for Ghana. But the main reason why it's such an issue is, because Ghana got unlucky and missed the penalty kick. But tbh, that's their own fault. Don't get me wrong, I definetly hate that this punishment wasn't as effective as it could have been, but I still haven't heard a better rule that's fair and clear in every other situation too. A red card can also be given when a player does something really dangerous (aka stupid), even if he didn't intend to hit someone. Jumping towards other players, having your foot at a height of a mans jugular/neck/face (or in jumping Alonsos case: chest), definitely is reckless and dangerous enough to send you off. Ok, it's a tiny little bit exaggerated, but Football doesn't need 12vs15 goals in the end. A goal has to be something special, being happy about finally scoring a goal is a lot sweeter when you're nearly despaired about a few close-but-not-quite shots. I don't want goals off an assembly line, so when you do get them, because they reflect the difference between the teams. I agree with most of the changes he proposes, mainly with the two (or why not five?) minutes off for "injuries" and the cards thing. However, regarding the amount officials I'd say either more officials or cameras but not both. Personally I'm for the cameras and use them in a similar way as it is done in tennis or in NBA: each coach would have two chances to request for reviews during each half time and that's all. This would keep the game democratized as Blatter wants (which is not a bad thing) because the game would be pretty much the same from amateur to world cup level. The thing I wholly disagree with is the penalty goal. Come on, as basic as the rule of playing the ball with the feet is, it is the rule that the ball has to get IN to be a goal. Gyan (and every penalty shooter) had almost 18 square meter (bigger than my student room) of goal to put it in and he put it on the 15 centimeters of the cross bar. Come on, it's a VERY BAD shoot and that's all. If we want to change the rules for that, then maybe we should forbid the goalie to use the hands, so it is easier to score, or why not making the goal bigger? Or putting the penalty point closer? I tried to watch the World Cup – but even filtered out – the damn Vuvuzelas drive me nuts. I think technically S Africa was a great host but they should not be ever REMOTELY considered for hosting a future Olympics unless they ban those damn instruments – that's not a symbol of national pride, that's national stupidity. Football is a GAME of conventions with rules. Not morality. Players should consider referee errors as a bad rebound or bad ball trajectory and not as injustice. When the referee mistake is grossly evident like the goal of England, there always remains what was once known as FAIR PLAY ! This attitude should come back in the GAME. Had I been the German coach, I would have shown the video of the goal to my team at half time. Gentlemen, this is what we are going to do: We are ahead 2-1, but actually the score is 2-2. When we return to the field, we will not move and let England score the goal they deserve and then...WE DESTROY THEM! Football is not just a game, it's a competition. And you don't easily throw away a lead, no team did and probably no world cup team ever will. But we all have to face it, Spain greatest team in the world? Spain is totally "catch me if you can" style. The way they play is just a horrible way of playing football. Germany played very well, but they couldn't win. Uruguay also, but they were stopped by netherlands. And well, I don't have to say about Brazil, everyone could see the way we played, wasn't the way we expected. Do you really believe that technology would keep the Dutch from honestly feeling disadvantaged by the final's ref?!!! Despite some obvious bad calls that should be cleared straight away for the sake of the sports credibility (like Lampard's goal vs Germany), the ruling principle of the ref's whistle must prevail as an integral part of the game (like the players, like the Jabulani) in which luck often is a decisive factor. I disagree with most of the article, penalty goals? Really? A red card and a penalty is enough, you can't just give goals if they haven't crossed the line. Suarez's handball was unsporting but was the right choice. I would hope any player from my club team or national team to do the same thing in a match of that importance (and so would most people). I agree that goal-line technology should be involved but it has to be available to every level of professional competition in that country. The suggestion that it should only be used in games with a lot of money or prestige at stake is stupid. Boohoo someone will have to "settle" for 2nd place in the league whereas lower down the football ladder more important matches (which don't have the technology) are played about the survival in their respective league. Spain have some of the best players in the world yet can only win 1-0, 1-0, 1-0. Another team did that, Greece in Euro 2004 (the won it btw)and I can't blame them because they had a terrible squad and won with 1-0s every match, that was they only way they could win it. Spain however were very disappointing. Hmm, the suggestion of the Blue card seems weak the way it is. Yellow Card (two blue equals yellow) – Diving, bad tackles, deliberate handling outside penalty area. Accompanied by a 10-minute ban of the player to the sideline. Red Card (two yellows equals red) – as is now. From this perspective, some yellows in the finals would have been blues instead (for example, Heitinga's second yellow was not a tackle thus should be blue, Robben's yellow for complaining would have been blue, Iniesta for removing his shirt after a goal etc). Puyol should still have been sent off for his foul on Robben as Robben was through on goal. But i agree that something needs to be done. If I compare this final to some matches played in the 70's, there are no more hard tackles today than back then but players overreact a lot more today than they did back then. If you don't agree, please watch Holland vs Argentina in '74 and also count the number of yellow cards that Argentina received and compare that to the 2010 finals. I am an African.But I rejoiced when Gyan missed the penalty-Uruguay deservd it.We shd stop blaming Suarez.He was penalised accordingly.Africa shd think of another team.We are tired of the usual failures like Ghana, Dvoire, Cmeroon ....etc. I agree with ur suggestion of goal-line tech.But the idea of a penalty goal, not a good idea. An extract from an interview with reputedly the greatest all round cricketer of all time, West indian Sir Garfield Sobers. More importantly, a true sportsman. "Sobers was one of those rare cricketers who never waited for an umpire's finger to go up. If he had touched the ball and been caught, he would walk. There was one occasion in a Test against Australia when he walked even before Wally Grout had appealed. To him it was pointless walking only in cases where one had scored a century. There was no point in cheating and winning. If he had caught the ball cleanly, he let the batsman know it and if he had grassed it, then he was equally open about it. He was a sporting person to the core."